With his broad smile, open face, and impressing sincerity, Hugo Chavez has plenty of natural charm that helps him attract allies even among the most experienced and cautious politicians. Nevertheless, it took him great effort to convince the Kremlin that he should be regarded as a serious, promising, and dependable partner. Radical liberals for whom Washington's hostility to Chavez outweighs any other considerations did a lot to plant distrust of him in Russia's ruling circles. As a result, the agenda of Russian PM M. Kasyanov's visit to Venezuela in December, 2001 was practically limited to formalities and tourist attractions. The Russian guest clearly felt uncomfortable with the macho Venezuelan president who wore a paratrooper uniform and expressed admiration for the accomplishments of the Soviet Union and the heroism of Russians during the Stalingrad Battle. At that time, Russia's Ambassador to Venezuela A. Ermakov managed to do a lot in the name of the rapprochement between the two countries. Meeting with intense resistance from the Kozyrev group in Russia's Foreign Ministry, which acted as the US Department of State's instrument of influence, he nevertheless actively “promoted” the Venezuelan leader in Moscow. 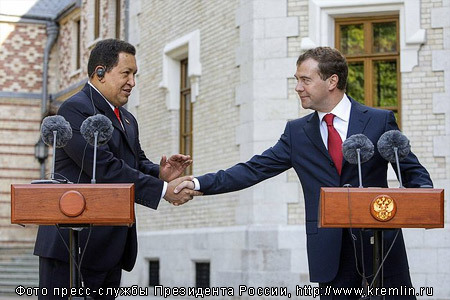 Chavez has visited Moscow a number of times over the decade of his presidency. The recent visit was the eighth one. As Russian President D. Medvedev said, the leaders of Russia and Venezuela used the meeting “to synchronize their watches” in the settings of the current global crisis and signed documents of unprecedented importance, including agreements on strategic projects to be implemented in cooperation by Venezuela's state-owned petroleum company PDVSA and the National Oil Consortium comprising Russia's oil grands. One of the projects is to form a joint venture for the development of the Orinoco Belt fields holding heavy and extra-heavy crude and for the construction of infrastructures for its transit to the Caribbean. Initiatives in the spheres of atomic energy and space exploration were also discussed during the talks. Furthermore, Venezuela plans to buy from Russia a large number of T-72 and T-90 tanks to replace its park of obsolete armored vehicles which had been in service since the 1950ies-1960ies. President Medvedev said Russia's tanks are excellent, and Chavez – former military officer knowledgeable about such things - nodded his agreement. Information about some of the arms trade deals was not released. As President Medvedev said, contracts of this kind are not necessarily signed in public, and Russia would supply to Venezuela the types of weapons the country is interested in, while fully complying with all the pertinent international regimes. There are indications that the range of armaments to be provided to Venezuela includes the Tor-M2E anti-aircraft systems, Varshavyanka-class submarines, Smerch multiple rocket launchers, mobile coast-based missile systems, Mi-28N copters, BMP-3 armored personnel carriers, etc. The two countries reached an agreement to establish a Russian-Venezuelan bank with assets initially totaling $4 bn to fund the projects. Several commentators in Russia responded negatively to Chavez's Moscow tour. Speaking to the KM news outlet, Deputy Director of the Latin America Institute of the Russian Academy of Science B. Martynov, for example, criticized Russia's plan to broaden the arms trade with Venezuela. He expressed the view that the initiative would yield short-term gains that would come with long-term costs. According to Martynov it is a wrong strategy to encourage Chavez's ambitions that “recently have grown totally oversized”. As an illustration of the statement concerning the oversized ambitions, Martynov invoked the complete set of standard allegations against Chavez that the West's propaganda services – especially those of the US – are actively disseminating. One can't help noticing the traditionally playful manner in which some of the Russian journalists comment on Chavez's visit. The impression is that they are safeguarding themselves against being suspected of liking this enfant terrible of the international politics who opposes capitalism and neoliberalism, espouses the XXI century socialism, and declares that the epoch of the US empire is nearing the end. The idea originated in Columbia, which is not surprising considering that A. Uribe's clique overseen by US advisers is constantly trying to subvert Venezuela. The efforts intensified since the US “expedition corps” in South America got 7 military bases in Columbia and, protesting the development, Chavez froze the relations with the country and stopped supplying fuel to it at discount prices. Olga Lopez (TIWY.COM) wrote that “The world against Chavez!” march was organized via Internet, mainly using the Facebook and Twitter social networks which function under the CIA control. A US-sponsored organizing committee relied on standard information warfare techniques and invited democrats across the world to join the «No más Chávez» (“Enough of Chavez!”) campaign. By the way, the slogan is widely interpreted not only as an infringement upon Venezuela's sovereignty but also as a veiled call to kill Chavez. Western media presented the global anti-Chavez march as a successful campaign and said that the numbers of participants in various parts of the world rose to thousands of people. The Associated Press featured the most detailed coverage of the campaign saying that the biggest rally – quite predictably – took place in Bogota. Several thousand protesters marched through the streets of Tegucigalpa, Honduras led by the de facto president R. Micheletti who seized power in a coup In June. According to The Associated Press, some 2,000 protesters rallied in Caracas. In Buenos Aires the number of protesters barely reached 200. Mexican El Universal stated that Chileans were uniting against Chavez, but in reality “the union” counted at most 15 people. As for protests in Mexico, by the way, no information about those seems to be available in Internet. Should we blame the absence of mass rallies on swine flu? EFE news service said about a hundred people marched against Chavez in Panama, but those were mostly Venezualan emigres. Russia was not mentioned in the context of “The world against Chavez!” campaign, which is good news. Despite all the endeavors of the fifth column and the media controlled by oligarchs Chavez remains popular in Russia. At the same time, the Western media somehow overlooked the response marches of Chavez's supporters which took place in 50 countries. This fact is indicative of how seriously the global neoliberal dictatorship takes the Venezualan leader who dared to openly challenge it. The global popularity of Chavez was strikingly obvious when he was cheered at the Venice movie festival which he attended to watch Oliver Stone's South of the Border. In the documentary, Chavez and his colleagues – Brasil's Lula da Silva, Argentine's Christina and Nestor Kirchner, Bolivia's Evo Morales, and Paraguay's Fernando Lugo - talk about the left turn in Latin America. South of the Border is not a commissioned apologetic movie – O. Stone is an honest man who rebelled against the demonization of Latin American leaders by the US and Europe. His documentary is a truthful story of the reforms and peaceful revolutions at the continent aimed at overcoming the chaos and disrepair created by the neoliberals with their fraudulent privatizations. It is highly optimistic as its main character is a revolutionary and a reformist deeming it his mission to build a socially oriented state, a XXI century socialism. Stone's key idea is that the alternative world is a possibility. Meeting Chavez, Russian Prime Minister V. Putin said: “As I have learned you are not only a statesman but also a movie star”. I wish there were more such movie starts.